Newly installed monitor well near the Mud Spring 1. 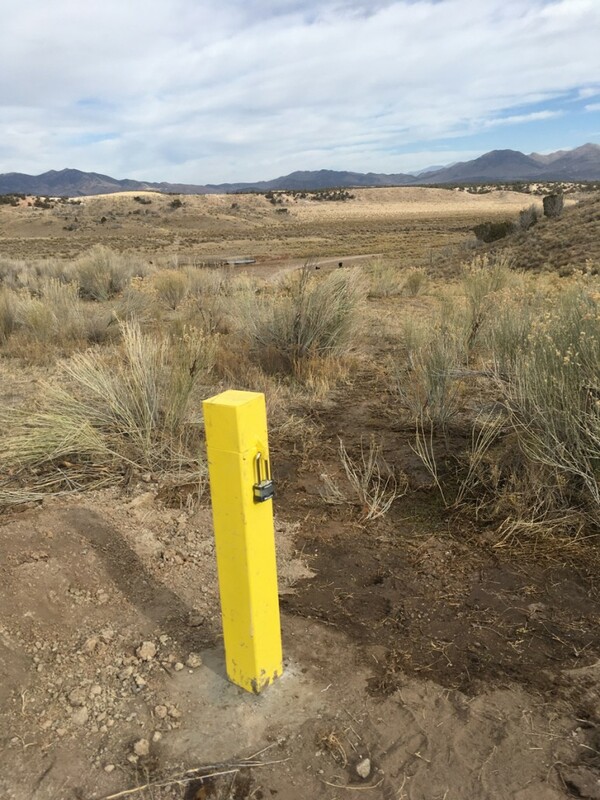 This well is in a control area and will be used to determine if changes in groundwater are related to pinyon-juniper treatment or climate variation. Beginning in the late 1800s in the Great Basin and east-central Utah, pinyon-juniper forests encroached downward from their original extent in the mountain ranges to cover much of the mountain front areas. The encroachment has been attributed to fire suppression, climate change, and land-use practices. Effects of these extra trees include increased wildfire hazard, reduced grazing forage, reduced sage-grouse habitat, reduced spring flow, and deeper groundwater tables. To mitigate these environmental problems, federal, state, and private cooperators in Utah and other Intermountain West states are conducting extensive pinyon-juniper treatment (i.e., cutting) projects. The treatments aim to increase sage-grouse habitat, reduce wildfire risk, and improve grazing for wildlife and livestock. Project proposals commonly cite increased shallow groundwater and spring flow as additional benefits. The Utah Geological Survey Groundwater Program has begun a five-year project, funded by Utah’s Watershed Restoration Initiative, to monitor the response of groundwater and wetland vegetation to pinyon-juniper treatments. In spring 2017, we began the project in northwestern Tintic Valley, about 50 miles south of Tooele and 10 miles north of Little Sahara Recreation Area. The area includes a 1-mile reach of perennial flow along Death Creek, and four springs. We will monitor spring flow, surface water flow, groundwater levels, groundwater chemistry, soil moisture, aquatic vegetation, and upland vegetation in two planned treatment areas and two control areas. The basic hypothesis is that groundwater recharge and resultant soil moisture, spring flow, and stream flow will increase in the treatment area due to succession of sage and grass having lower water use than the juniper forests, whereas similar changes will not be observed outside the treatment area. Vegetation monitoring will be conducted to test the hypothesis of increased wetland extent and to provide habitat data to compare with sage-grouse monitoring data collected by Utah State University. Monitoring in control areas having similar topography and hydrology to the treatment areas will enable us to distinguish variations in spring flow, groundwater levels, and soil moisture due to climatic variation from those resulting from the treatment. Climate will be monitored using data from an existing station operated by the U.S. Bureau of Land Management. Pre-treatment monitoring will establish baseline conditions and the hydrological response to climatic variations. Post-treatment monitoring will quantify changes that result from the treatment. Vegetation monitoring will focus on possible expansion of current wetlands adjacent to springs and Death Creek, and on succession of pinyon-juniper forest by sage and grasses. Chemical and isotopic sampling of springs and wells will help detect possible changes in local recharge rates. Monitoring of spring and stream flow by hand began in spring 2017, as did chemical and isotope sampling. We have identified gaining and losing reaches along the stream and an abrupt change in stream chemistry that likely corresponds to groundwater inflow. Spring flow decreased slightly over the summer, suggesting seasonal variation and, therefore, sensitivity to climatic fluctuations and annual recharge. Installation of piezometers, soil moisture-monitoring sites, flumes, and vegetation transects occurred in fall 2017. During the next few years, we anticipate learning how seasonal and annual precipitation and climate variations affect the groundwater system, and how the surface water–groundwater system functions. After the treatment in 2020, we will look for changes in these patterns that reflect increased recharge in the treatment areas.